Hello everyone. 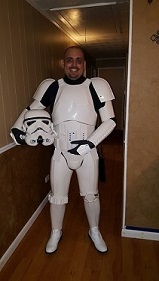 I've spoken to quite a few of y'all at Cyphacon today (I also spoke to some of y'all at Wizard World on January 6), wherein I expressed my interest in joining the 501st. 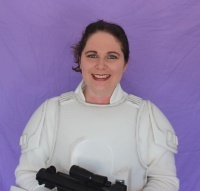 I've already started putting together an Imperial staff officer, and was wearing it to the convention. Looking forward to getting that completed and sent in for approval! Hi, well to bag. Can’t wait to troop with you. If you have any questions don’t be afraid to ask. We are here to help. I’m glad you got on the forums. We saw your officer and you are well on your way being approved. Welcome aboard. If I can do anything to help you along or if you have any questions, feel free to drop me a line. Hi Daniel I think we spoke at cyphacon briefly. My monthly work day is on Sunday April 15th and Watson. It runs all day feel free to come on out meet people and get your hands dirty. Thanks for the welcome, guys. I should have everything I need for my Staff Officer costume by the end of the week, so I will be sending my application then. dalcan1 wrote: Thanks for the welcome, guys. I should have everything I need for my Staff Officer costume by the end of the week, so I will be sending my application then. Fantastic! You will need to send those to Shane Aubrey for approval. You can also send them to me so I can photoshop them for upload. Do you know what pictures you need to take? Yep, the thread on the Information for New Members was pretty straightforward. I did have a question: what constitutes an “action pose”? I don’t have a weapon for my costume, so would looking like I’m thinking about something count? I also take it we’re not allowed to have props which are not part of our costume in the action pose.